So, in less than three weeks I am running a half marathon. What? Even though I've known about this race, and have been training for it since December, it still managed to sneak up on me. As of right now I still have no idea what it feels like to run 13.1 miles -- but watch out, because it'll be happening soon. I am scared. I am also really, really excited. So far my training runs have topped out at 8.3 miles (last Sunday) and I could have gone further (barely). It is worth noting that last Sunday's run was the very first time I felt any sense of confidence re: my ability to finish the race. All I want to do is finish, and not get injured, and be able to go out that night & celebrate my birthday. Yes, my birthday. As if this wasn't all enough -- the half marathon is on Sunday, June 16th, and my 31st birthday is on Monday, June 17th. Truth be told, I kinda planned it this way, because to me running a half marathon is something I never thought I could do, and I think birthdays are the perfect time to do impossible things. There's a nagging voice in my head, though, that's going WHAT ARE YOU THINKING?!!? about the idea of being able to go out to my favorite wine bar (Hotel Biron) with my favorite person (Scott) & get drunk that night on European wine and eat cheese & olives (yes, cheese -- my birthday Manchego). I really wonder how I will be feeling that evening, but I can only hope it's good, because I am not giving up my birthday wine bar experience, so there! 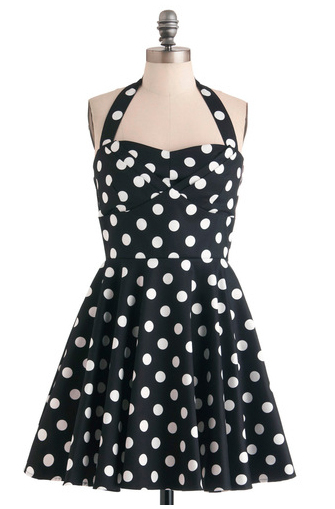 Just like last year, I've gone with Modcloth and polka dots. This one has really high ratings and I waited a while for it to be available in my size, so I can't wait for it to get here! I really hope it looks good. I guess I should talk about this, too: how do I feel about turning 31? I feel ... pretty much nothing, actually. 30 was such a big deal to me last year and this year I've actually found myself worrying because I feel really nothing about this birthday. Of course I'm going to milk it for all its worth (of course!) but I don't feel negatively or positively about this number, which is kind of a relief after last year. There are definitely things I want to do in my life that have an expiration date (having kids definitely falls into that category) so that's really the only thing causing me any sort of anxiety about my age. Other than that, which I imagine is a very common concern about the early 30s, it's smooth sailing. It really is amazing, though, how fast this last year has passed, and how much I have changed. There has been a lot of good, but there has also been an above-average volume of tough times, and I'm glad I'm coming out of them a better person. I often find that the even numbered years in my life are "years of growth" that often contain "shitstorms" and this one was no different. I think I handled aforementioned crises with more finesse and acceptance than ever before, and if that's not making the transition into real adulthood ... then what is? Anyway -- this year my goal is to become even more awesome than last year. A fine goal, if I say so!